Minister of State at the Department for Business, Innovation and Skills, Matthew Hancock, has seen how GAIN (the Growth Acceleration and Investment Network) is driving innovation and enterprise in the South West. At a visit to Plymouth University yesterday (8th January 2015), the Minister saw how businesses are benefiting from GAIN’s support and how Government investment is enabling them to achieve their growth potential. A partnership founded by Plymouth University, Plymouth City Council and Plymouth Science Park, GAIN drives economic growth by harnessing the knowledge, skills and facilities of higher education, linking these to business. GAIN is delivering the Peninsula City Deal Growth Hub, part of Plymouth and South West Peninsula City Deal, funded through the Government’s Regional Growth Fund (RGF). Mr Hancock met Ellie Cruse, founder of award-winning start-up business EcoKitty, which sells environmentally-friendly handmade cat products. Support from the Formation Zone, through GAIN, gave the former Plymouth University administrator the confidence to focus on being a fulltime entrepreneur. The Minister had a tour of Plymouth University’s Marine Building to see the UK’s most sophisticated wave energy testing tank. The facility enables researchers to recreate ocean conditions to test marine technologies, including wave energy devices. He met representatives from Plymouth firm Msubs, who specialise in underwater vehicles and equipment and have worked extensively with the University. The Minister heard how the Plymouth and South West Peninsula City Deal is enabling the growth of the marine sector across the peninsula. During a tour of the University’s Centre for Robotics and Neural Systems, Mr Hancock found out how the centre’s cutting edge research is furthering our understanding of artificial intelligence and the human brain. 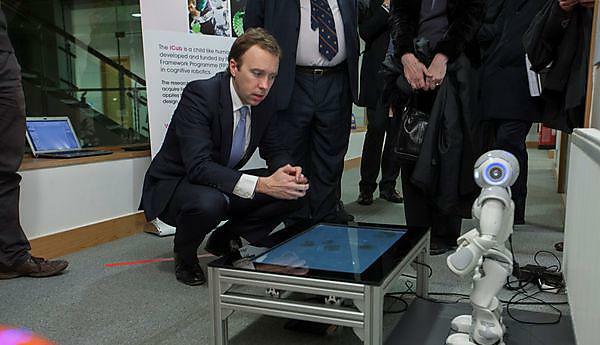 He also saw how the University’s global collaborations are helping to develop robots that could, for example, support elderly care or act as companions for children in hospital.